In the video game industry, developers will often have “postmortems” of their games- they explain their development process, what they did right, and what they could’ve done better. The Nutmeg Book Festival seemed to attract a predominantly mature crowd- a lot of the people who bought my book were buying them for young relatives. I sold seven books at the festival- about one per hour. Besides books, I also had postcards printed up featuring my book cover on one side and an excerpt from the book on the other. To begin with, I’m very happy with the way I presented my book at the festival- I had my “elevator pitch” ready, but I didn’t have to give it much of the time- I had a brief description of Me Squared sitting in a frame with an excerpt from the book, and it seemed to help drive sales. Most of the people who saw my table stopped and read the excerpt- this surprised me considering the length of said excerpt. Right beneath the excerpt was a handy QR code for access to the digital version of my book. While it wasn’t particularly utilized, this was mostly due to the demographic attending the festival. 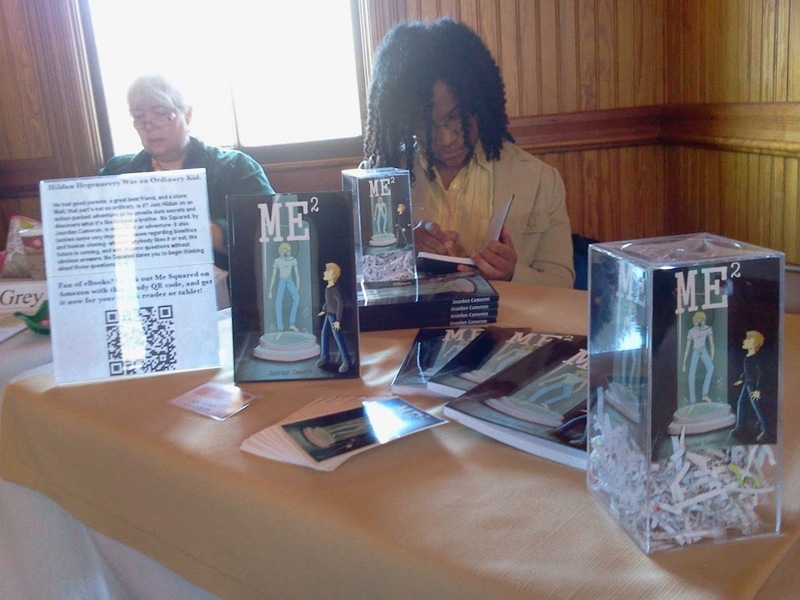 When it came to explaining my book, I told people the basic premise: a boy named Hildan discovers that his parents thought he’d be ill before his birth; he was healthy, but now there’s the ethical dilemma of a clone- Me Squared is a book about brotherhood and the morality of human cloning, and it’s full of action and adventure. That was the basic gist of how I explained my book- I didn’t have a script. I hit upon a few main points and let my words flow- I was also careful about being to-the-point. Of course, if anybody wanted to know more about my book, I was happy to explain my inspirations, creative process, etc. Regarding the postcards, I put plenty of thought into those- having seen them given away at events like PAX and Comic-Con, I realized how handy they can be- larger than business cards, and a lot more noticeable, but still small enough to avoid being intimidating. Honestly, who wants to pick up a flyer for a book? The postcards were a great success, and on the back, I made sure to add a QR code to my Amazon page alongside other important info, such as the URL of my Facebook page and my Twitter handle. So, what lessons were learned? Have your pitch ready, don’t underestimate how willing people are to read a rather large sample of your book, and have postcards or something similar to give to people- bookmarks are a great idea. Finally, be sure that you know what your book is about- be ready to explain it quickly and easily, but don’t be scared to go into detail when it’s called for. In other news, if you by any chance use Goodreads, I have created a page for Me Squared over there, check it out! In case you missed it, Me Squared is now live on Amazon. ← Me Squared – Out Now!